FRANKFORT, Ky. - Jefferson County's McNeely Lake is a good destination for canoeists, kayakers and those in small boats because the use of gasoline-powered motors is prohibited. Located in Okolona, a suburb about 15 miles south of downtown Louisville, the 51-acre, L-shaped impoundment is reached via the Beulah Church Road exit off the Gene Snyder Freeway. Turn right onto Cooper Chapel Road and follow the signs. 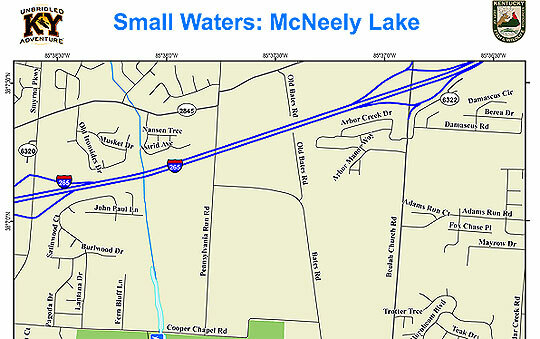 The lake is located within the 746-acre McNeely Lake Park, operated by the Louisville Metro Parks system. Theres a concrete boat launching ramp and courtesy dock close to the park entrance. There is no fee charged to launch. Open to fishing in 1955 and owned by the Kentucky Department of Fish and Wildlife Resources, McNeely Lake has 3.3 miles of shoreline and a maximum depth of 30 feet near the dam. However, most of the lake is less than 10 feet deep. "McNeely Lake has lots of bank access," said Jeff Crosby, central district fisheries biologist for Kentucky Fish and Wildlife. For being so close to town, its a dandy fishing spot. Theres good bank access on the western shore of the lake, including several fishing piers. Other facilities include a picnic area with shelter, playground, restrooms and walking trail. Park hours are 6 a.m. to 11 p.m. Most anglers fish for bluegill, redear sunfish, crappie and catfish. The lake is managed under statewide creel and size limit regulations. Shad may not be possessed or used for bait. Shad eradication in 1997 greatly improved panfish populations. Beds of water willow that extend about 10 feet from the shore provide cover for panfish. Recent sampling of the lake revealed a good number of 6- to-8-inch bluegill and 6- to 9-inch redear sunfish. "The redear sunfish like the deeper water on the edges of flooded grass," said Crosby. Drifting is a good fishing strategy for redear sunfish and bluegill. Red worms, mealworms and wax worms are the best live bait and should be fished on light spinning tackle. The basic panfish rig is a long shank No. 10 hook, a small split-shot sinker and a bobber. Attach the split shot about 10 inches above the hook. Adjust the depth of the bait so that it is suspended just off the bottom. 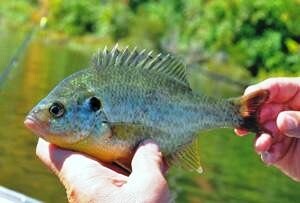 Larger redear sunfish tend to stay in deeper water, away from the banks, from 4 to 8 feet deep. McNeely Lake also receives a yearly stocking of 1,300 channel catfish measuring up to 9 inches. The area southeast of the dam that is not accessible to bank anglers tends to offer some of the best fishing because theres less pressure. It takes about 20 minutes to reach this spot by paddling or motoring with an electric trolling motor. This small arm of the lake is surrounded by woodlands. It features scattered stump beds in the lake bed and numerous fallen trees along the banks. Theres good cover for largemouth bass. Sampling revealed largemouth bass are present in all sizes up to 21 inches. "There are lots of 10- to14-inch bass, and good quality bass weighing 2 to 3 pounds," said Crosby. These fish provide excellent sport with fly fishing gear or light spinning tackle.